uPVC Patio doors excel at creating space and filling rooms with light. Built on a sleek sliding mechanism, you can save space with these doors. Contact us for more details. Our uPVC patio doors – which are manufactured by Kommerling, a recognised leader in their field – will deliver the style and performance you need. Two different profile systems are available, both of which deliver outstanding performance, plenty of style, and are incredibly easy to maintain. uPVC patio doors installed by Fox Windows & Doors are an investment for any home. Customise your uPVC patio doors to suit your design requirements, whether you’re improving your home or extending it. We cover Kenilworth, Leamington Spa, Warwickshire and surrounding areas – so contact us today for a quote. The customers we install uPVC patio doors for want a product that will keep their home warm. Each Kommerling profile we install includes a 5-chambered insulation system designed to stop heat escaping, while simultaneously preventing unwanted cold air from entering your home and making it uncomfortable. Personalise the appearance of your uPVC patio doors by accessing a rich portfolio of 44 different woodgrain foils and colours. You can further enhance the look of your installation by adding hardware, accessories and door furniture of your choice. Build your product online now and get a free guideline quote in minutes. Whichever profile option you choose, your uPVC patio doors will come fitted with a market-leading multi-point locking system to prevent almost all unauthorised attempts to gain entry to your home. Stay better protected with a uPVC sliding door made by Kommerling and installed by Fox Windows & Doors. Your uPVC patio doors will exhibit clean, modern sightlines - whichever angle you view them from. They will stand out for all the right reasons and are bound to catch the attention of anyone who comes to visit. Better still, they’ll look at home anywhere - in your front room, lounge or even your new extension. Our Kommerling uPVC patio doors are kind to the environment. They are lead-free, which means you’ll be buying a product that’s been designed and built to minimise impact on our ecosystem. Find out more about our stunning Kommerling range by talking to an expert today. We’re ready to answer any of your questions. The Kommerling range has been tested to ensure strong performance when exposed to extreme weather. Your installation will be able to cope with extreme cold or heat without its appearance or capacity being compromised. This is a door you’ll be able to enjoy and depend on for a long time. Keep the outside in view always. The extensive use of glazing throughout your new sliding doors will keep your garden in view at all times – even during winter, when it’s too cold to open them wide and enjoy those cooling summer breezes. This is a door that will add value throughout the year. Although other designs of door have their merits, many of them open inward. This can cause problems if objects or furniture are placed near your installation – as damage to them could be caused. Because uPVC patio doors open and close horizontally, you won’t have this problem. Light can transform even the smallest space. Our uPVC patio doors, which are extensively glazed, will fully illuminate your home or extension. All year round, you’ll be able to enjoy a room that feels bright and spacious – and which will be ever-connected the outdoors at the same time. 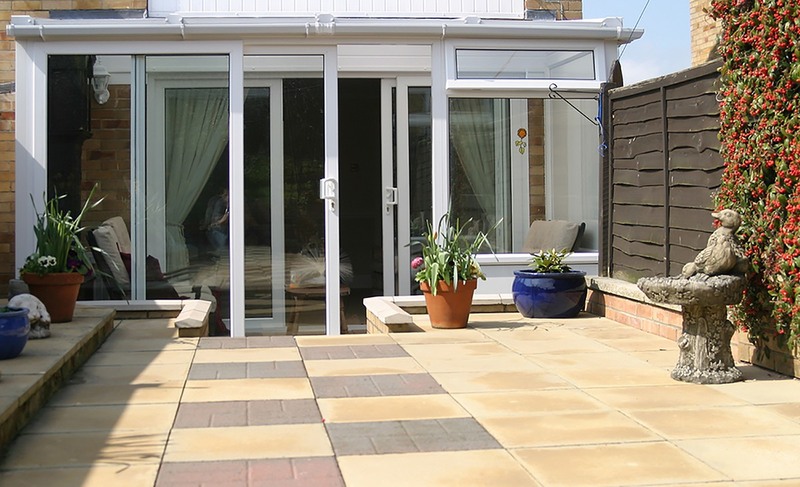 Our uPVC patio doors slide back and forth on rollers along a dedicated horizontal track. They require little effort to operate, and are extremely quiet. Clever technology built into each profile prevents injury through improper operation, so you can buy from us with peace of mind. Beautiful and long-lasting uPVC French doors for lounges, living rooms, conservatories and more. Get an online quote within minutes using our new design tool. Our uPVC patio door installation services are available in Kenilworth, Leamington Spa, Warwickshire and surrounding areas. Use our door designer tool which will allow you to create free, no obligation quotes for patio doors in an instant. Talk to our team today if you have a technical question about our uPVC patio doors. We can also provide guideline quotes over the phone or book in a time to come and visit you.